Epson's TM-U220: TM-U220A, TM-U220B, TM-U220D printers are compact, reliable and fast, and offer all the easy-to-use features important to the retail, restaurant and hospitality industries. 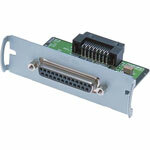 TM-U220: TM-U220D, Impact, Serial Interface, Tear bar, two-color printing, 6 lps. Includes power supply. Order cables separately. Color: Dark gray. 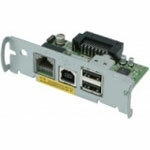 TM-U220: TM-U220D, Impact, USB Interface, Tear bar, two-color printing, 6 lps. Includes power supply. Order cables separately. Color: Dark gray. TM-U220: TM-U220PB, Impact, Parallel Interface, Auto-cutter, two-color printing, 6 lps. Includes power supply. Order cables separately. Color: Dark gray. TM-U220: TM-U220PD, Impact, two-color printing, 6 lps, Parallel interface. Includes power supply. Order cables separately. See accessories. Color: White. TM-U220: TM-U220D, Impact, two-color printing, 6 lps, Serial interface. Includes power supply. Order cables separately. See accessories. Color: White. TM-U220: TM-U220A, Impact, Serial Interface, Auto-cutter, Journal Take-Up, two-color printing, 6 lps. Includes power supply. Order cables separately. Color: Dark gray. 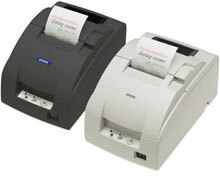 TM-U220: TM-U220B, Impact, USB (No DM/Hub) Interface, Auto-cutter, two-color printing, 6 lps. Includes power supply. Order cables separately. Color: Dark gray. 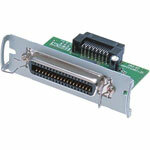 TM-U220: TM-U220PD, Impact, Parallel Interface, Tear bar, two-color printing, 6 lps. Includes power supply. Order cables separately. Color: Dark gray. 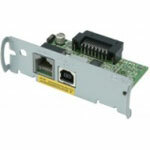 TM-U220: TM-U220D, Impact, USB Interface, Tear bar, two-color printing, 6 lps. Includes power supply. Order cables separately. Color: White. TM-U220: TM-U220B, Impact, Serial Interface, Auto-cutter, two-color printing, 6 lps. Includes power supply. Order cables separately. Color: White. TM-U220: TM-U220PA, Impact, two-color printing, 6 lps, Parallel interface. Includes auto-cutter, journal take-up, & power supply. Order cables separately. See accessories. Color: Dark gray. TM-U220: TM-U220PA, Impact, two-color printing, 6 lps, Parallel interface. Includes auto-cutter, journal take-up, & power supply. Order cables separately. See accessories. Color: White. TM-U220: TM-U220D, POS Impact Printer, 9-pin, serial impact dot matrix, RS-232 interfaces, 4.7 lps (at 40 columns, 16 cpi), 6.0 lps (at 30 columns, 16 cpi), Includes PS180 power supply and solid cover. TM-U220: TM-U220B, Impact, Serial Interface, Auto-cutter, Traditional Chinese, two-color printing, 6 lps. Includes power supply. Order cables separately. Color: Dark gray. Barcode Ribbons, Black Ribbon for TM-U200, TM-U300, and TM-U375, 10 ribbon case. Available in three different modesl, TM-U220: TM-U220A, TM-U220B, TM-U220D printers are compact, reliable and fast, and offer all the easy-to-use features important to the retail, restaurant and hospitality industries.